Don’t just have basic music in the background during your first dance, instead sway along to a slideshow. Imagine you and your guests watching a show comprised of pictures of the lives of the bride and groom. You supply us with the slide show and we will set your presentation to the music of your choice. 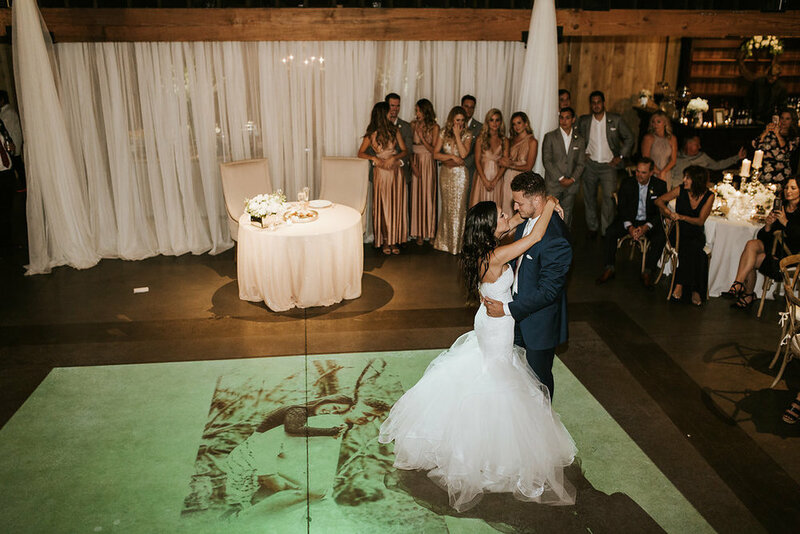 It can be viewed through a projector mounted in the ceiling and shown onto the dance floor or through our pop-up style screen! Crazy talented, Canadian photography duo, Juan & Angie, captured these incredible shots last September during a clients wedding at Mint Springs Farm. While slideshow projection isn't always available for use at every wedding venue that we work with due to equiptment needs, we do offer an alternative pop-up style screen for displaying slideshows, still images, and videos. To learn more about our slideshow projection services, please contact us today.